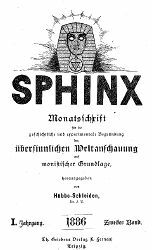 German occult, spiritualist and parapsychological journals now digitized and available online. The history of parapsychology has been one of my research interests in recent years. It is not so long ago that I reviewed Heather Wolffram’s recent book on German parapsychology, Stepchildren of Science, and noted that it breaks new ground in providing access to little-explored German sources – in English. Much of the source material for German parapsychology is indeed very hard to access outside of Germany. In my own research, I have been able to draw on a good collection of psychical research literature at the Amsterdam University Library, much of which was collected by a students society for psychical research active in Amsterdam in the early 20th century. Even this collection is weak on German sources, however. The same is true for the digital collections available through Archive.org – a great resource for anglophone sources, but less so for other languages. In my case, I had to spend a couple of days at the IGPP’s collections in Freiburg to finish the parts of my research that dealt with German parapsychology.